STANSW Young Scientists were wonderfully recognised for their achievements at the recent 2018 Australia Day Awards. Heading the list was Macinley Butson from The Illawarra Grammar School who was the NSW Young Australian of the Year winner. 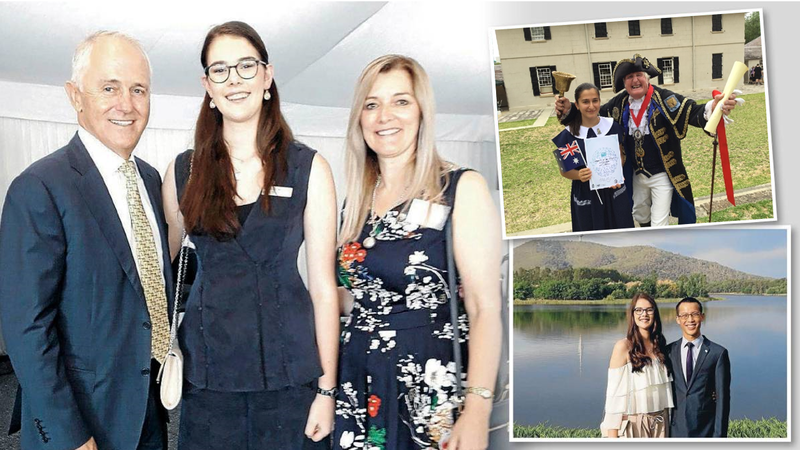 Her exploits in the Young Scientist Awards since she was in Year 3, culminating in a 1st place Grand Award at the 2017 International Science and Engineering Fair was a major factor in her selection. Evette Khaziran (top right) from Redeemer Baptist School won a high achievement award in the Parramatta City Council’s Young Citizen of the Year award for her discovery and conservation of a sugar glider colony in the centre of Parramatta. Maddison King from Meriden won the Cumberland Council’s Young Citizen of the Year award for her Clever Girl rip-detecting device. The STANSW Young Scientist Committee would like to congratulate these girls and express our delight in the high level of community recognition that our awards program receives. We would also like to congratulate Cherrybrook Technology High School’s Head of Mathematics, Eddie Woo (bottom right with Macinley Butson), who won Australia’s Local Hero Award for 2018. With our strong STEM collaboration with MANSW we are very excited that a fellow passionate STEM teacher has won this popular award and has done wonders in raising the profile of teachers in our state and nation.